What's in Your Mc Donald's Menu? 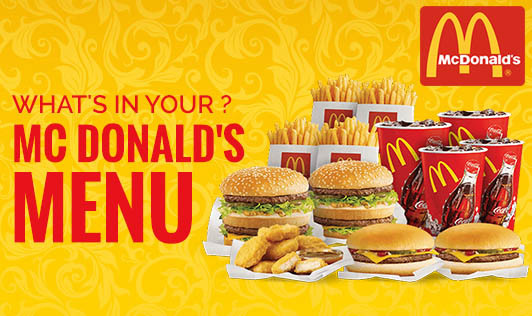 Mc Donald's is a famous international chain of restaurants. Managed by Ronald Mc Donald, it has become a popular choice of food for youngsters, families, birthday celebrations, and a part of some people's everyday routine. Its attractive names, creative variations and tastes have drawn a whole fan-following trend towards it. McDonald's predominantly sells burgers, various types of chicken sandwiches and products, french fries, sweetened beverages, and desserts. Have you ever wondered what goes into your Mc Donald's menu? We all have heard of it being unhealthy, but what is all the hype about? As a nutritionist, I'd like to throw some light on the calorie content of these products. Although most of these products come in good combinations and varieties, they may not be a healthy choice to make. Non-vegetarians are definitely spoiled for choice here with the number of options available for them, while vegetarians may find it hard to make a choice with a limited menu. There are several different products available here. The chicken maharaja Mc is a marketing skill of mc Donald's to attract customers by increasing the size and taste of the burger. The truth is that it only has double layered patties and doubled layered bread, while the rest of it remains the same. The choice of meat and vegetables too is quite limited, with no sea food included on the menu. If you look at the calorie content of these products, you will see that they are almost equal to what one needs for a single meal, and in some of them, the requirement of calories for two and three meals in a day can be fulfilled by a single product on the menu. These items are usually coupled with a carbonated beverage or a serving of French fries that further add on to unnecessary calories and fats. The sodium content of each of these products is unbelievably high. The sodium for one dish is equal to a day's sodium intake. Also, have a look at the fat content of each dish. It is equal to a day's requirement of fat and in some, almost double the recommendation for a day. The unnecessarily generous calorie, fat and sodium content of each food take away the importance of protein and fiber that could be a part of these products. Mc Donald's has definitely made its mark in the market for fast foods in terms of attracting customers, but with respect to nutrition, it would get a negative score. It's undoubtedly the wrong choice for weight watchers. For those of you addicted to Mc Donald's, think twice before you take that bite! !